Historic Guthrie at Christmas is one of the most magical experiences in Oklahoma. The Pollard Theatre is a pivotal part of the traditional Christmas celebrations, and this year they’re offering a different story from the one they’ve become famous for. After the deaths of two important artists who helped create The Territorial Christmas Story, beloved Scrooge James Ong and playwright Stephen P. Scott, the company has decided to give themselves a year-long deep breath to recoup, and redesign, their traditional Christmas staple. This temporary reprieve has opened the door for another classic Christmas story to grace the Pollard stage, and it’s genuinely The American Christmas Story. 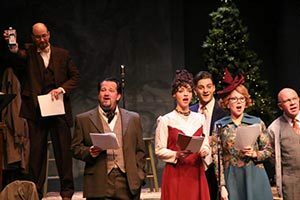 It’s A Wonderful Life: A Live Radio Play by Joe Landry ushers audiences into a long-forgotten golden age of radio entertainment, before televisions arrived in every home and nobody knew what their favorite actors looked like. The cast begins the play as radio actors, walking in from the back of the house and greeting the audience, which has now become the studio audience. Each actor takes their places, ready to begin the live radio program. They kindly let the audience know that we are active participants, encouraging those in the studio audience to clap along and create the story with them. Kara Chapman is Sally Applewhite, the glamorous actress portraying Mary Hatch. Joshua McGowen is Jake Laurents, the charming young actor charged with playing George Bailey. Kris Schinske Wolf is Lana Sherwood, and she portrays several roles with her diverse voice skills, including Violet Bick. Timothy Stewart is Harry Heywood and several other roles, including George’s brother Harry Bailey. David Fletcher-Hall is William Buckingham and Clarence the wayward angel. James A. Hughes is Freddie Filmore and portrays an assorted array of characters within the radio play, including the evil Mr. Potter. Foley artist Jared Blount is an interesting addition to the activity onstage, providing context and detail with simple props that create ambient sound effects. 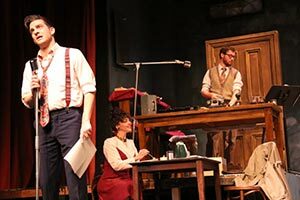 The idea of a radio play is different, and the Pollard offers a unique experience for patrons. The 1940s era costumes are elaborate and beautiful, but even with the visual representations and the actors on stage, it’s tempting to close your eyes and experience the show as truly an audio interpretation. It’s so pleasant and realistic to do, so try it! You won’t feel silly for long, and you can always open your eyes again to watch the story play out. 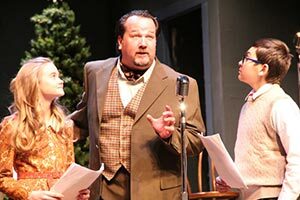 Joshua McGowen, Kara Chapman, and Jared Blount (Foley artist) in It’s A Wonderful Life: A Live Radio Play. As the radio program progresses, the actors slowly dissolve into their Wonderful Life characters, and the show becomes more and more of a traditional stage setting. The change is subtle and the shift is gradual. Only when the snow begins to fall on George Bailey’s life altering evening is it obvious that we’re no longer in a studio, but have been transported to Bedford Falls. The roles of Mary Hatch and George Bailey that were portrayed in the 1946 film by Donna Reed and war veteran Jimmy Stewart have been canonized in the American psyche. It’s simply impossible to reproduce the performances exactly, and never the goal of a true artist to create a copy of the originals. But how to chisel away and create something new? That is what Chapman and McGowen have done. 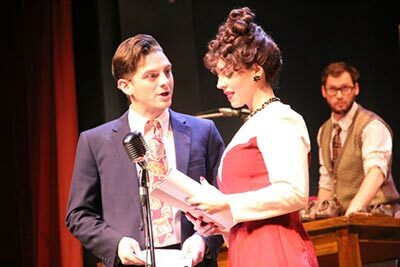 Joshua McGowen and Kara Chapman as George and Mary in It’s A Wonderful Life: A Live Radio Play. Chapman as Mary is vibrant and lovely, easy to fall in love with and admire. She creates a truly classic leading lady, set in a timeframe many years ago, but never overdone or tired. Chapman’s speaking voice and stylized accent are accurate representations of decades past, and she sounds just as beautiful talking as singing. Chapman’s portrayal of the radio actress and her flirtation with Blount as the Foley artist is a fun little secret storyline to peek at throughout the show. McGowen is at times reminiscent of Jimmy Stewart, particularly in his speaking cadence, but his mannerisms and demeanor are wholly his own. McGowen offers a beautiful homage to the timeless movie. His performance is spellbinding, heartbreaking and captivating. The struggle of his character is felt by everyone in attendance, and hearts are lifted along with his. Trying to find a dry eye in the house, even among the critics, is nearly impossible. 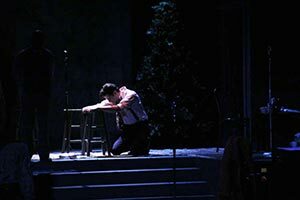 Joshua McGowen as George Bailey in It’s A Wonderful Life: A Live Radio Play. Instant connections are made between McGowen and Chapman, who have sparkling chemistry together and bring to life some of the most iconic scenes in all of American cinema memory. David Fletcher-Hall as Clarence the Angel is joyful and touching. Fletcher-Hall saves the day as the hero’s hero, bringing true purpose to light. James A. Hughes and Timothy Stewart play so many roles, it would be hard to keep up, but each one sounds uniquely different. The same is true of Kris Schinske Wolf as Violet, who takes a turn as Mary’s mother, then George’s mother, and several other minor characters. No shortcuts can be made in voice acting, as there’s no visual to fall back on. These brilliant artists create an entire cast of characters, and if you couldn’t see them, you’d hardly believe there was only a handful of them. The supporting cast proves itself as versatile and multifaceted. Likewise, Jared Blount as the Foley artist is a unique addition that you don’t see often onstage. It’s mesmerizing to watch what mundane items he brings to life to create specific sounds, like celery for snow, a comb for outdoor crickets, and a wooden door, to represent entrances and exits, naturally. Papers rustle, glasses clink, and the world of It’s A Wonderful Life comes alive with a few items. Timothy Stewart (center) with Ruth Daigle (left) and Austin Barber (right). The child actors are always an added joy to any play, especially a Christmas play, and the ones on stage here are superb. Impressive performances are given all around, with Austin Barber as Young George/Tommy, Jaxon Pickens as Young Harry/Pete, Rianna Stottemyre as Young Mary/Zuzu, and Ruth Daigle as Young Violet/Janie. These young artists exemplify professionalism and produce delight. They’re a perfect troupe of little Bailey children, at times annoying their father and other times bringing absolute glee to both their parents. Hannah Finnegan serves as Stage Manager. Scenic design by James Hughes and Michael James creates both a radio studio and a sleepy town of Bedford Falls. Lighting design by Artistic Director W. Jerome Stevenson is beautiful and poignant. Period costumes are artfully designed by Michael James, and the production is directed, as always, brilliantly and thoroughly by Stevenson. 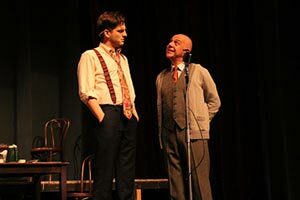 Joshua McGowen as George Bailey and David Fletcher Hall as Clarence. Stevenson and his company continue to create not just memorable pieces of theatre, but shows that are love letters to their audience. It’s A Wonderful Life: A Live Radio Play is heard, seen, and felt as an act of love to all Pollard patrons, those who’ve made the theatre a part of their family’s holiday tradition, and of course, the recently gone but never forgotten Mr. Ong and Mr. Scott, the artists of Pollard Christmases past whose spirits are felt on that stage ever still. It’s A Wonderful Life: A Live Radio Play continues at The Pollard Theatre until December 23rd, in historic downtown Guthrie. The theatre is located in the heart of the Christmas festivities, at 120 W. Harrison Ave. For tickets, call 405-282-2800, or visit the website at thepollard.org. Don’t miss this WONDERFUL holiday production!